What is Eris and why is it important? In 2005, astronomers Mike Brown (1965–), Chadwick Trujillo (1973–), and David Rabinowitz (1960–) used a sophisticated, modern version of Clyde Tombaugh’s technique to discover a new solar system body beyond the orbit of Pluto and larger than Pluto. Originally called 2003UB 313, this object settled once and for all the question of whether or not Pluto was the largest Kuiper Belt Object in the solar system: it was not. Further observations showed that 2003UB 313 even had its own moon. For a while, this new KBO and its moon were jokingly referred to as “Xena” and “Gabrielle” by its discoverers, in reference to a mythical television heroine and her companion. The discovery of 2003UB 313 hastened the need for planetary astronomers to define the term “planet” in a scientific way. 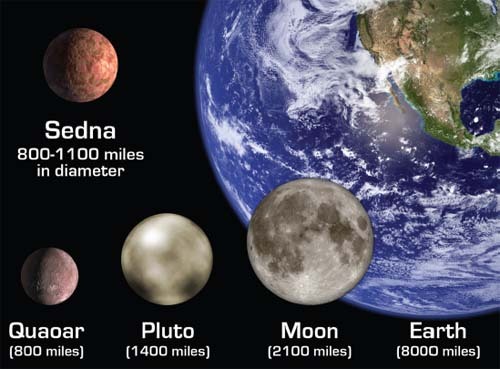 Since it was larger and more distant than Pluto, Eris would have to be called the tenth planet, unless Pluto was no longer to be considered a planet. After substantial debate, the objects were officially reclassified in August 2006 by the International Astronomical Union (IAU). That is why there are only eight planets in our solar system today, and why Pluto is not one of them. Not long after this decision, the IAU committee that determines the official names of solar system objects approved the official names of 2003UB 313 and its moon, names that were requested by its discoverers. Today, they are officially known as Eris and Dysnomia, the Greek goddesses of disagreement and argument.